For Lady Julia Grey and Nicholas Brisbane, the honeymoon has ended…but the adventure is just beginning. investigative talents to work once more. 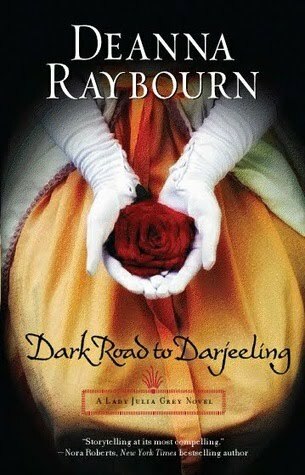 At the urging of Julia’s eccentric family, they hurry to India to aid an old friend, the newly widowed Jane Cavendish. Living on the Cavendish tea plantation with the remnants of her husband’s family, Jane is consumed with the impending birth of her child—and with discovering the truth about her husband’s death. Was he murdered for his estate? And if he was, could Jane and her unborn child be next? This is the fourth book of the series, the first book is Silent in the Grave. Deanna Raybourn’s Lady Julia series is what a Victoria Holt novel wants to be when it grows up. With Victoria Holt, you get atmospheric Gothic mysteries that are just a little twisted spiced up with just a little romance. There is nothing “just a little” about the Lady Julia books. Raybourn amps up the twisted factor and the romance by a rather large degree, and what comes out of it is nothing less than phenomenal. This mystery is just like all the others: captivating and nearly impossible to puzzle out before the end. I love not being able to figure out things early…it is sometimes fairly easy to deduce that whatever track Julia happens to be on is wrong, but as far as trying to decide what is really going on? Good luck. Brisbane takes basically all the other leading men in books like this and wipes the floor with them. He is dark, tortured, brilliant, merciless when need be and absurdly devoted to the thing(s) he finds important. Lady Julia is an awesome character. As manly and imposing as Brisbane is, she certainly holds her own against him. I love them together so much! They are two of the most impetuous characters I have come across, and throwing them together is never short of electric and explosive. I could not be any more in love with this series, and the next book cannot come quickly enough! Disclosure: I read this book via NetGalley. the first sentence of your review is awesome!! i haven't read anything by this author, but i want to!